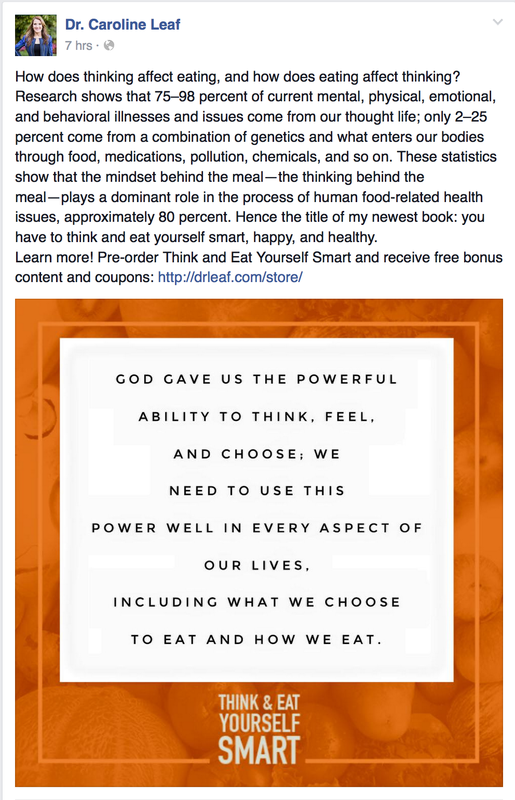 Update: Read my full review of “Think and Eat Yourself Smart” here. They say, “Never judge a book by its cover.” What about judging it by its marketing? Dr Caroline Leaf is a communication pathologist and self-titled cognitive neuroscientist. She’s also a wannabe nutritionist. Her latest book is “Think and Eat Yourself Smart”, due for official release at the end of April. I haven’t read her book yet so I’m not really sure what she’s going to say. It might be a well reasoned and soundly researched discussion about healthy eating, except there are some conflicting ideas that are appearing in Dr Leaf’s own marketing of the book, so I’m not holding out much promise. This is bogus science. It doesn’t matter if I’m convinced that eating a half gallon tub of ice cream is nutritious or not, it’s going to have the same nutritional effect on my body (namely, none). It’s not 80 percent healthy because I believe it’s healthy. Dr Leaf’s assertion that “75 to 98% of current mental, physical, emotional and behavioural illnesses and issues come from our thought life” is a favourite factoid of hers that forms the basis of most of her teaching. Except that it’s wrong. It has no basis in fact. I’ve discussed this at length in several blogs and in my book (see here for a more detailed explanation of Dr Leaf’s 98% myth). It’s unclear just how much of her book Dr Leaf has based on this false assumption, but the fact that it’s there in the first place sets a bad precedent for the rest of the book. Only time will tell, of course. I’d like to be proven wrong, but unfortunately, Dr Leafs latest book seems to be plagued with the same poor science as her other tomes. This entry was posted in Biological, Caroline Leaf and tagged bogus, caroline leaf, cognitive neuroscientist, criticism, diet, dr caroline leaf, false teacher, ice cream, mindset, nutrition, think and eat yourself smart, thinking by cedwardpitt. Bookmark the permalink.